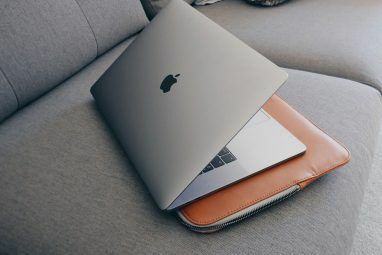 If you’ve got gadgets that use external storage, it’s always important to buy the right card for the job How to Pick & Buy the Best SD Card for Your Needs How to Pick & Buy the Best SD Card for Your Needs What kind of SD card is right for you? Not all of them are the same, after all. Here are the minimum specs you should aim for depending any given activity or need. Read More . But for the most demanding tasks, it isn’t always possible to find a card that’s big enough or fast enough for your needs. That could be about to change. Samsung has recently launched some new high-capacity memory cards based on the new Universal Flash Storage (UFS) standard, which promises speeds that are up to five times faster than high-end microSD cards. Sounds great! But how is it so fast? And what’s the catch? Let’s explore. UFS is a new flash storage standard for consumer electronics devices. 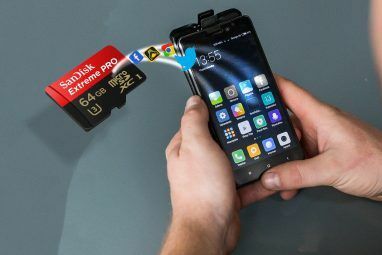 It’s designed as a next-generation replacement for eMMC (which is used for internal storage in devices like smartphones and tablets) and SD cards (which are used as external storage by smartphones, DSLRs, etc). The standard is supported by a host of major tech companies, including Samsung, Toshiba, Micron, and Texas Instruments. The latest version of the UFS spec — UFS 2.0 — could potentially deliver speeds that rival solid state drives 7 Terms You Need to Know When Buying a New SSD 7 Terms You Need to Know When Buying a New SSD While SSD specifications may seem overly daunting at first, the truth is that these terms are quite simple to understand. Read More . They’re certainly faster than eMMC and considerably faster than both SD and microSD cards. Samsung’s internal chips based on this spec include a sequential read speed of up to 850 MB/s — compared to about 550 MB/s in a typical SSD — and are capable of 40,000 input/output operations per second (IOPS), compared to 13,000 in the latest eMMC products. In addition, UFS is more power efficient than eMMC storage. It uses 10% less power when in use and 35% less in daily workload performance. UFS was used for the internal storage in Samsung’s Galaxy S6, S7, and Note 5 smartphones. 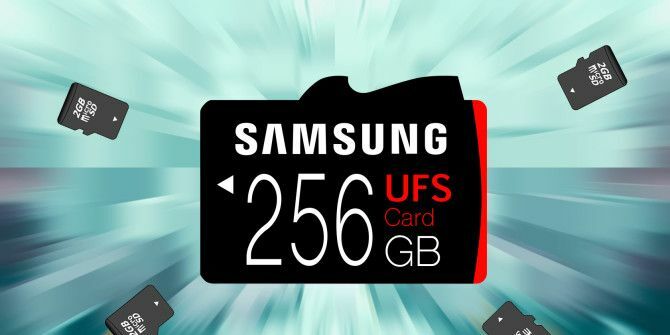 Samsung has also introduced the first UFS memory cards, with other manufacturers likely to follow in the coming months. Samsung’s first range of UFS memory cards are based on the older UFS 1.0 spec. Yet even so, they still offer a number of advantages over microSD cards. For starters, the standard sizes have larger capacities. Samsung’s UFS cards start at 32 GB and increase to 256 GB while microSD cards typically max out at 128 GB. Samsung has only recently begun shipping its first 256 GB microSD in the EVO+. They also have the speed benefits of internal storage. The EVO+ cards promise read speeds of up to 95 MB/s and write speeds of up to 90 MB/s. Indeed, the 256 GB UFS card has read speeds up to 530 MB/s — more than five times faster — and almost twice the write speeds at 170 MB/s. The faster write speeds are ideal for applications where very large amounts of data are recorded in a short space of time. This includes shooting 4K video (and 8K when the time comes), 360-degree video for VR conten What Are Facebook's 360-Degree Videos and How Do You Upload Your Own? What Are Facebook's 360-Degree Videos and How Do You Upload Your Own? Mark Zuckerberg recently unveiled something new coming to your News Feed. It's called 360 Videos, and Zuckerberg thinks it's the future of watching videos. Read More t, or multiple high resolution RAW images Budding Photographer? Here's Why You Should Be Shooting Raw Budding Photographer? Here's Why You Should Be Shooting Raw Every dSLR, prosumer and even some high-end compact cameras have the ability to save raw image files. This isn't just a higher quality of image, it's a gift from the photography gods. Read More on a DSLR. The small size is also perfect for mobile devices like drones 8 Questions to Ask When Buying Your First Drone 8 Questions to Ask When Buying Your First Drone Buying a drone is equal parts exciting and confusing. Here are some common questions most beginners have when purchasing their first drone. Read More and action cameras Buying a GoPro or Action Camera: 7 Useful Things You Need To Know Buying a GoPro or Action Camera: 7 Useful Things You Need To Know If you're into skiing, cycling or surfing, then an action camera is the perfect way to record your adventures. Read More . The faster read speeds will significantly decrease the amount of time taken to copy that content to a computer (assuming that the computer and the connection to it are fast enough How to Optimize Data Transfer Speed to and From External Drives How to Optimize Data Transfer Speed to and From External Drives Do you have a short fuse? Transferring data between a PC and external storage is a common task and slow transfer of files can be extremely frustrating. Fortunately, you can easily improve transfer speeds. Read More ), as well as previewing it within the device, browsing thumbnails, etc. There could be benefits for smartphone users, too. The slow and inconsistent performance of SD cards meant that external storage was never a great fit for apps. But with UFS cards having “internal storage” speeds — plus lower latency and power consumption — it may be possible to run apps right off the card with no adverse effects. All of these stats relating to the speed of UFS refers to the theoretical capabilities of the technology, or in other words, performance under lab conditions. Until the cards start being mass produced and used in the real world, we can’t say with any certainty whether it’ll live up to the promises. That being said, benchmark tests of the UFS memory used in the Galaxy S6 and S7 devices can give us an idea of what to expect. The data shows that they are significantly faster than Android devices using eMMC storage when reading and writing large files. In random tests, where smaller files are constantly read or written, the difference is less pronounced — performance is only on a par with other devices. The anomaly in these tests is the iPhone 6s, which uses neither eMMC or UFS storage. We’ll have to wait and see whether UFS memory cards live up to the hype. And that’s currently their biggest downside — there are currently no devices that support them. Even if Samsung chooses to include a UFS slot in the upcoming Note 7 smartphone, adoption throughout the industry will be much slower. There’s enough industry support to help it, and demand for larger and faster cards is only going to increase, especially in prosumer devices. The new UFS cards are not compatible with the current microSD card socket. However, we have developed a socket design that can support both UFS cards and microSD cards. We are working with different partners in the industry on this integration for next-generation devices. But the fact remains that the widespread adoption of new standard takes time, especially when it is replacing something that is already very well established, as SD and microSD are. Is UFS the Standard of the Future? On paper, UFS memory cards have the potential to completely replace the SD card, and serve our never-ending need for more — and faster — storage. It won’t happen overnight though. Samsung has not yet said when the cards will be available, or how much they will cost, and there’s still no devices to use them in. So, exciting as it may be, don’t throw away your microSD cards just yet. What do you think of UFS memory cards? Do you need a faster card? Will you be buying one? What gadgets do you think they would benefit most? Sound off in the comments below! Explore more about: Memory Card, Storage, Technology.
" — there are currently no devices that support them." NOT true. The new Fuji X-T2 soon to be released (9/8 Tokyo) supports them. I was just in the store and saw the physical card myself. Any idea on time scales when it might be out? I had no idea about this technology. Thanks for a great article! But not compatible with microSD. A pity.